Minimum quantity for "Shelf Divider, 1" H x 9-9/16" L, Magnetic Mount, MSD-1510" is 25. 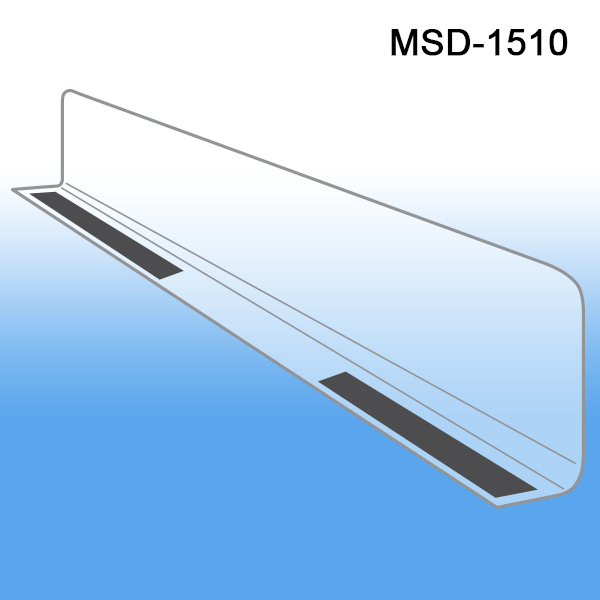 Need Adhesive Based Mounting Shelf Dividers at same size? See one we carry here. Using Clip Strip Corp.'s NEW magnetic mount shelf dividers when separating products on the shelf is smart product merchandising. They prohibit product from crossing over into each other's rows or section and confusing the consumer. Using these magnet shelf dividers keeps products in order and organized at retail. You will also be able to use them many times over, moving them a few feet or a few aisles during resets, new plan-o-grams, etc. Reusable and repositionable shelf product partitions from Clip Strip Corp. to be used on metal gondola shelves or other steel displays.